When the Cats walked off the field after playing the Bulldogs in Round 19, they took more than just the win from the Dogs. They took a record away, too. That afternoon, Joel Selwood notched up his 585th free kick, more than any player has recorded in the AFL era, which began in 1990. Selwood overtook Bulldogs great Scott West, the previous record holder, who had notched up 584 free kicks over the course of his career. Selwood received another two frees when they played the Bombers last weekend, taking his career total to a monumental 587. 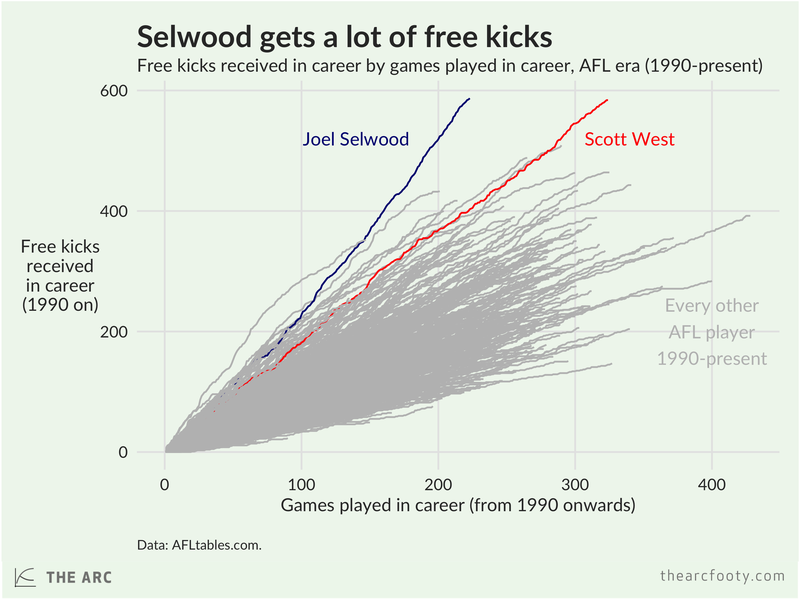 It took Scott West 324 games to rack up 584 free kicks, but Selwood took just 222 games to break his AFL-era record, a stunning average pace of 2.6 free kicks per game. 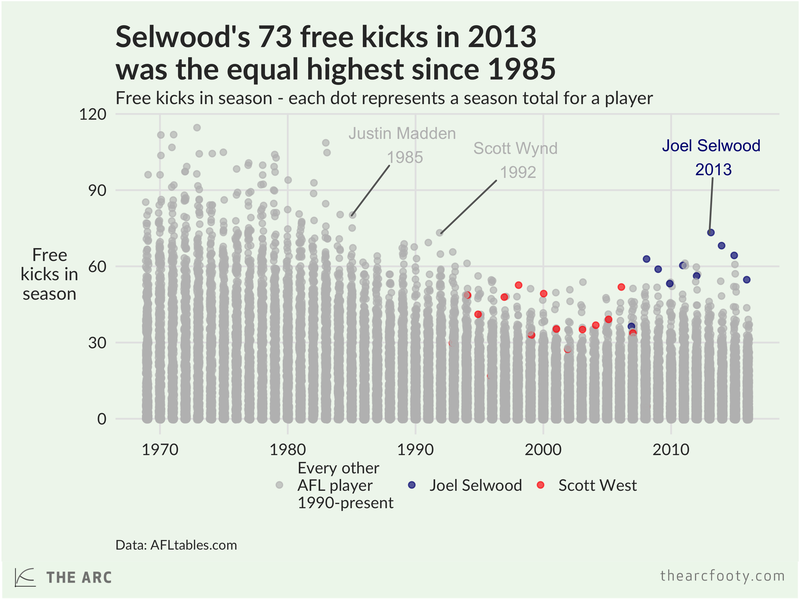 Selwood’s best season so far was 2013, when he received 73 free kicks. That was the most any player had received in a season since Scott Wynd also received 73 frees in 1992. The last player to receive more free kicks in a season was Justin Madden, who received 80 in 1985. 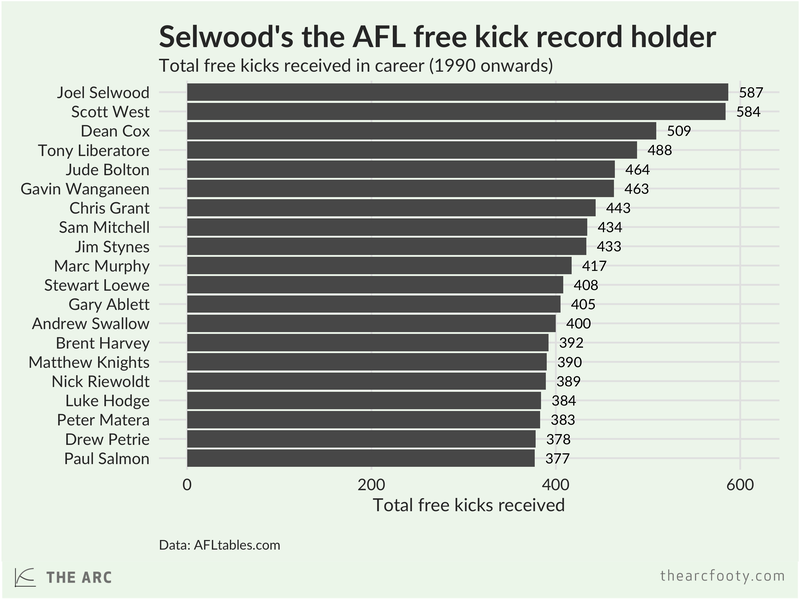 But that doesn’t quite do justice to Selwood’s truly monumental record in accumulating free kicks. As you can sort of make out in the previous graph, average free kick counts have fallen over time. Umpires don’t blow their whistle for a free nearly as often as they did in the 1970s and early 80s. Receiving 80 free kicks in 1985 is just not as exceptional as receiving 73 in 2013. 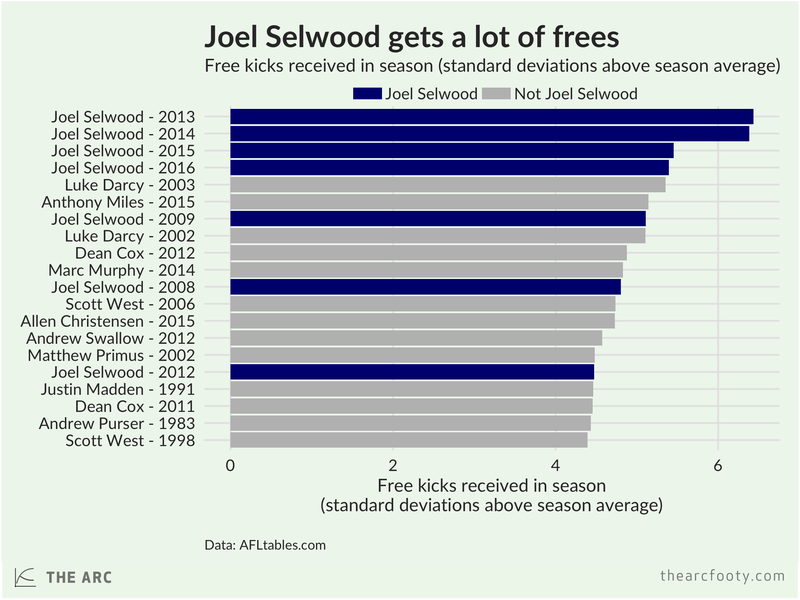 To put Selwood’s performance in perspective, we can standardise it – in other words, we can calculate how many free kicks each player received relative to the average for each season. Players in 2013 recorded an average of 11 free kicks. The standard deviation was 9.6 free kicks. Selwood managed to receive 73 frees, which is 6.4 standard deviations above the average. No player has ever come close to that before, at least since 1969 when the data began. 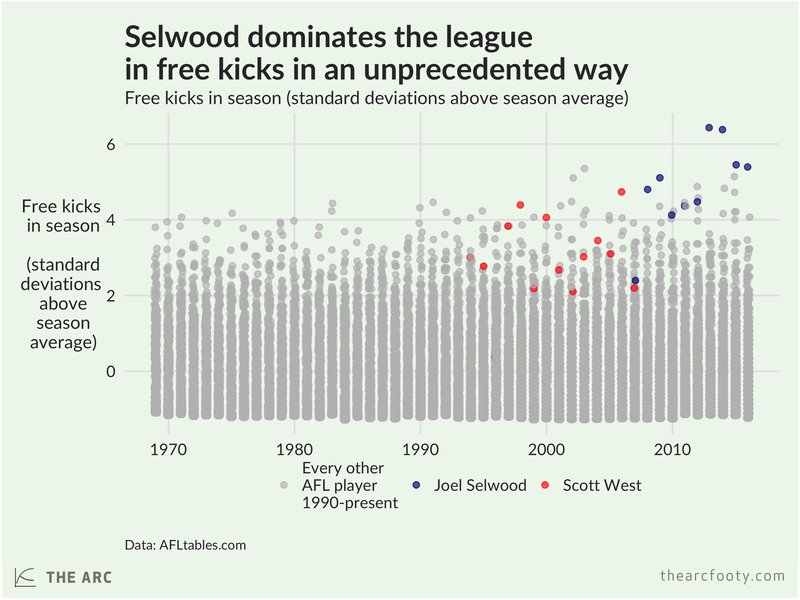 In fact, no other player has ever received enough free kicks to put them 6 standard deviations above the average in the season, but Selwood has managed to do that twice. Joel Selwood is truly without peer in the ability to accumulate free kicks. When it comes to free kick accumulation, the best four seasons in AFL/VFL history since 1969 are Joel Selwood’s past four, at least when we standardise the statistics. We are fortunate to have the chance to watch a true, all-time record breaker do his thing. Previous article	← How do Josh Kennedy and Lance Franklin’s seasons compare to past Coleman medallists?